The last few posts on this blog have been about the Anniversary CAL, but I have been doing a lot more than just finalising the pattern for the CAL. Patterns are generally written well ahead of publication, then tested and refined – the publication hasn’t taken much of my time at all. So today I will share a round-up of activity from the last few weeks. First I was happy to have 2 designs published in different magazines both of which were released on the same day! What a very happy co-incidence! Again these were prepared and written months ago, but the excitement of receiving the magazines and seeing the designs in print (and beautifully styled) is immense. And, of course, I give myself plenty of time to read the magazines over a cup or 2 of coffee! 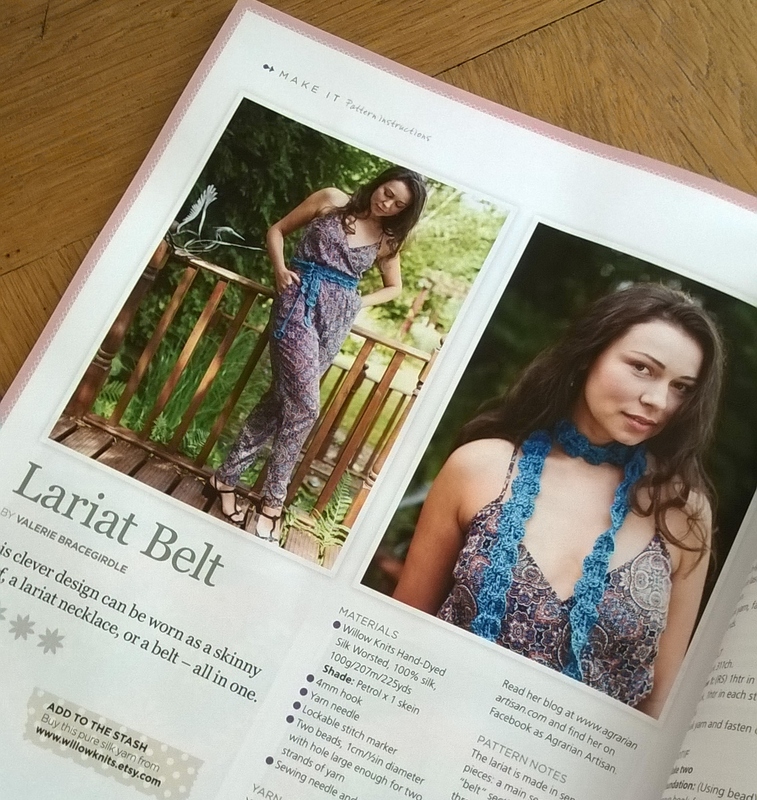 The first item is the Lariat Belt I designed for Inside Crochet, issue 68. This one is a flexible design – it can be a skinny scarf, a lariat necklace or a belt – the perfect item to pack for holiday. It is made in some of my favourite yarn, WillowKnits handdyed worsted silk, and it is relatively quick to make, so even if you are off on holiday next week I am sure you can make this in time. 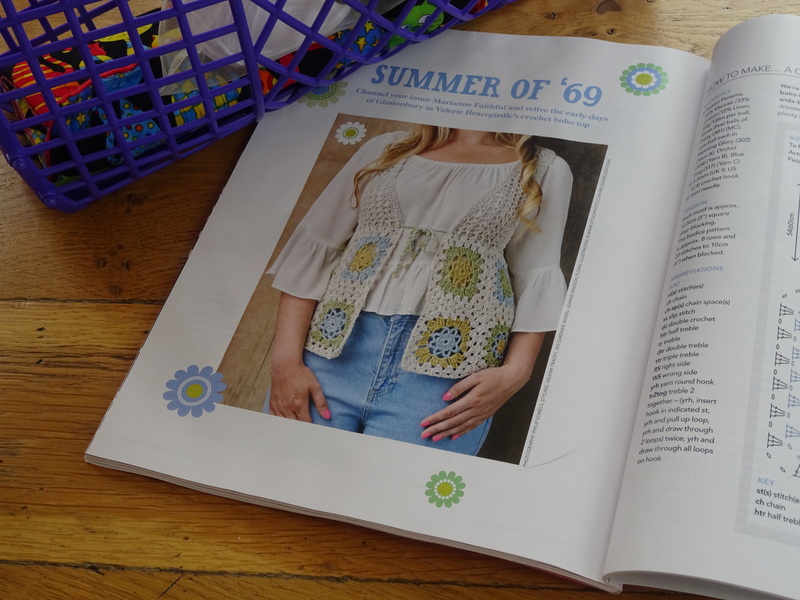 The second design is a retro Boho Top for Mollie Makes, issue 56. I had such fun making this! It comes in 2 sizes and I designed it so it is made in one piece and requires very little sewing up. 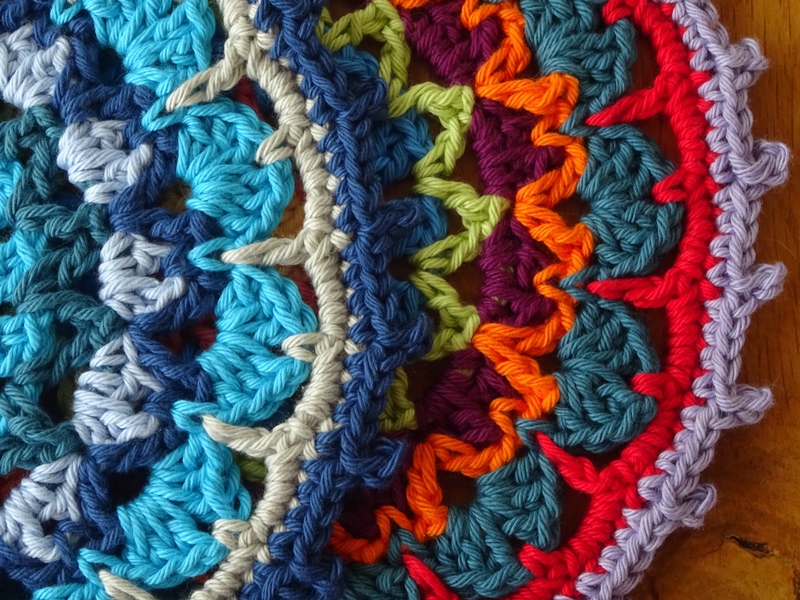 I know that finishing a crocheted or knitted garment is generally one of the most disliked tasks, and I know of many pieces that languish in cupboards and drawers awaiting sewing up. For the boho top the motifs are joined as you go and the bodice is made upwards from the motif section, the edging is incorporated into the bodice as you make it and there are probably less than a dozen sewing stitches required to join the shoulders. So once you finish hooking it takes minutes to finish the garment! You may recall I mentioned a while ago that I treated myself on the spur of the moment to a set of Hamanaka crochet hooks from Janie Crow. I had my eye on these for a while, they looked small and neat, and being double ended meant that I could carry a large range of hooks in a small bag. They haven’t disappointed me at all. I haven’t used anything else since I bought them! I bought a set of 5 regular sizes, a set of 3 small sizes and a small case for them. The hooks are lovely to handle and, for my small hands, a perfect size. I added a small pair of scissors, some tapestry needles and stitch markers to the front pocket in the case and I now have a perfect little crochet kit. Hamanaka – heaven in a hook! I have been working on a simple granny square cushion in lovely handdyed 4 ply silk, and you can tell from this photo that I have used the hook a lot (evidenced by the dye accumulating on the handle near the hook shank – don’t worry, I know from experience that this will wash off easily). 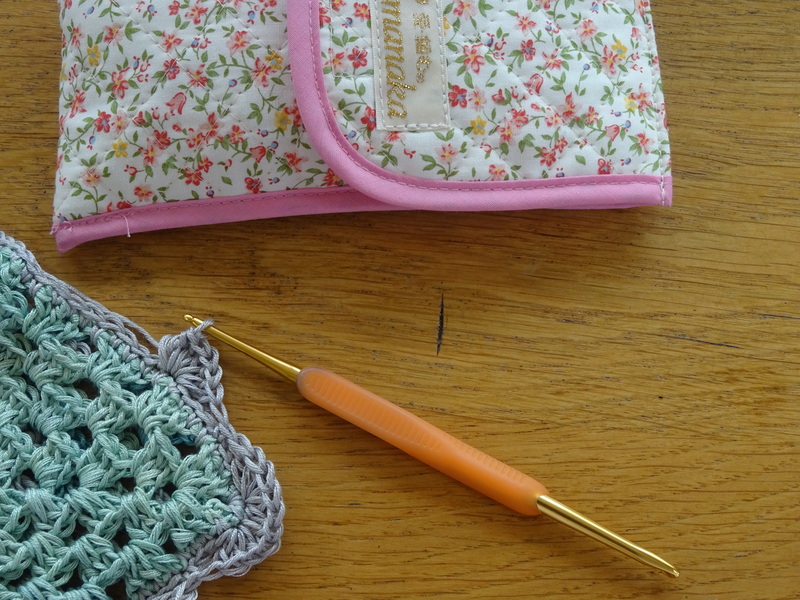 Another thing I like about these hooks is that the 3mm and 4mm sizes are on the same hook, and these are the sizes I use the most – so if I want to travel light with crochet, that is the only hook I need carry. And I have been making some ‘mini bunting’ from a pattern by Emma Lamb published in Mollie Makes Crochet, another great selection of crochet patterns. This now adorns the headboard of the spare bed. Previously my Anniversary Crochet Flower mini bunting adorned the bedhead but I felt it was in need of a refresh and a narrower colour palette – 2 of Emma’s flowers from the book were perfect for this. So what has been keeping you busy this last month? I’ve been finishing my second Shop No? Shirt No? Ah Yes Springlifter bag – however I can’t work out how to post a photo!!! Technical advice required!! I’m no expert on technology either………! Congratulations on getting in two different magazines. Well done! I’ve finished a granny stripe afghan and started a pair of socks.